An indictment was submitted Wednesday to the Jerusalem Magistrate's Court by the state attorney's department for the investigation of officers, charging Border Police officer Matan Amichai with harming privacy and misusing his post. The accusations against Amichai refer to an incident half-a-year ago, when during a routine mission to identify crimes adjacent to the Shiloach (Silwan) neighborhood just south of Jerusalem's Old City a Border Police force checked a car in which two Arab residents of Silwan were riding with two Jewish girls. Amichai, who was part of the Border Police force, is accused of taking the teudat zehut (ID card) of one of the Jewish girls and photographing it with his cell phone. Later he sent the image through the WhatsApp phone application to former MK Dr. Michael Ben-Ari, with the words: "the ID card of a girl who went with two Arabs and her friend to Eilat, the two are from Silwan, Michael if you can pass this to the proper sources please do. We are Magavnikim (Border Police officers - ed.) from Silwan, please save this anonymously. I wanted to cry now." He also sent the image to Bentzi Gopshtain, director of the Lehava anti-assimilation organization. 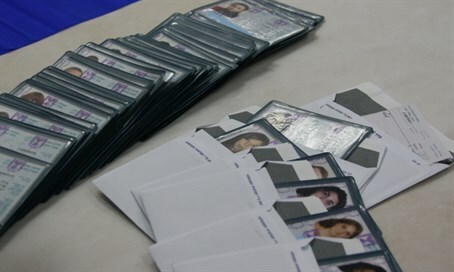 "We members of the Border Police of Silwan stopped a car next to Silwan and saw two Arabs going with two Jewish girls to Eilat, here is the ID card of one of the girls, please do something...we can't do anything in a case like this," he wrote to Gopshtain, again asking that the matter be handled anonymously without referencing him as the source of information. According to the indictment, Amichai knowingly misused the private details of a person and arbitrarily harmed her rights. In response to the indictment, Gopshtain said in a statement, "instead of the Israel police giving this officer a certificate of appreciation for his concern for his sisters, he receives an indictment. This is a disgrace. The police need to deal with Arabs who seduce our daughters. The government of Israel must combat assimilation." "Every day I receive cases from citizens, soldiers, officers and security personnel. The people of Israel care about assimilation. I expect that the new Attorney General, as someone for whom assimilation is important, will cancel the indictment." Leftist MKs last November unsuccessfully tried to get Lehava banned, despite the fact that the courts already ruled the group's activities to prevent assimilation as per Jewish law are completely legal. Practically all cases of assimilation in Israel involve Arab men and Jewish women, with the women frequently suffering extensive abuse.